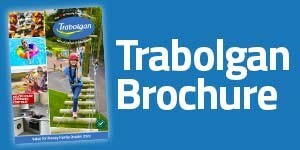 With a superb range of self catering accommodation, Trabolgan is sure to have the perfect holiday home for you! At Trabolgan we pride ourselves on our comfortable, affordable accommodation in a safe, friendly environment complete with CCTV for added peace of mind. It’s accessed by well-lit tree-lined walkways and comes with a well-equipped kitchen, TV, central heating, bed linen and car parking and is the perfect family-friendly place to relax in after an action-packed day. We offer a range of holiday homes from intimate one-bedroomed houses right up to our largest homes that can accommodate up to nine people, meaning we can find something that’s right for you, no matter how small or large your family or group are. Please note no pets are allowed, with the exception of guide dogs. The Perfect Self Catering Break in Ireland! We are delighted to offer you the perfect getaway, with great quality homes, in a location that is second to none. For those that wish to unwind, we offer idyllic landscapes and pampering; whilst for those seeking activity and adventure, we provide a wide range of activities for all the family. On check each house will receive a resident's voucher booklet with onsite discounts, 2 for 1 offers and a whole lot more. Trabolgan offers a memorable break throughout the season and we work tirelessly to ensure you have the holiday or break of a life time. Download our brochure now, or find out more about the wide range of adventure activities we provide. Alternatively, button below to book now or call our reservations team TODAY on +353 (0) 21 4661551 to book.